Axe Heads Found In A Pine Box. 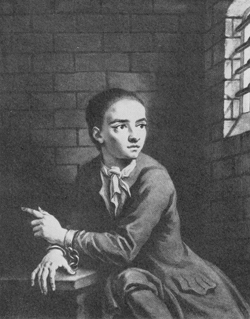 1724: Jack Sheppard, celebrity escape artist. A Link. Surgery. Only slightly off topic. I have to fly down to Sydney for surgery on the weekend & expect to be away for about 2-3 weeks. Then I have further rehab when I return home, so I will not be able to reply to comments or answere questions for a while. Someone said that at least it won't be like the 18th century. Well actually the last time I was cut open it was done without any anesthetic, no local, nothing. Not even a stiff drink! They did not even have a lead ball for me to bite down on, I had to roll up my handkerchief and bite down on that whilst I gripped the sides of the bed. Bitten round ball from surgery. They say that what does not kill you makes you stronger. I am not so sure of that, but it is definately life changing and all our experiences together make us who and what we are. This time round I am assured they will Anaesthetise me so hopefully [A] I will wake up, and [B] the surgery will have been successful. I am all for learning new experiences, but once is quite enough thank you. It did teach me what my pain threshhold was though, and for that I am thankful. But ever since I have had to explain to doctors why my RSI is only a 4, and why my arthritis is only a 5-6! With any luck I will see you all later and catch up on my posts. I am looking forward to running the woods again, well at least dog trotting! Take care everyone and I will see you down the trail later. Think positive, I am. Horns & Shot Pouches. A Link. 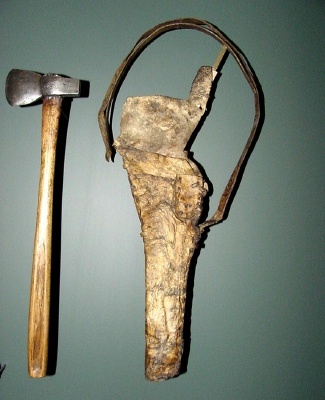 My thanks to Elmo for asking about the carrying and safety aspects of tomahawks. As far as the covering of blades is concerned, I think it was a personal choice based on experience. I told Elmo about the trapper who slipped on ice and fell on his tomahawk which had no blade cover and was carried under his belt. The blade cut his hand off as he tried to break his fall. 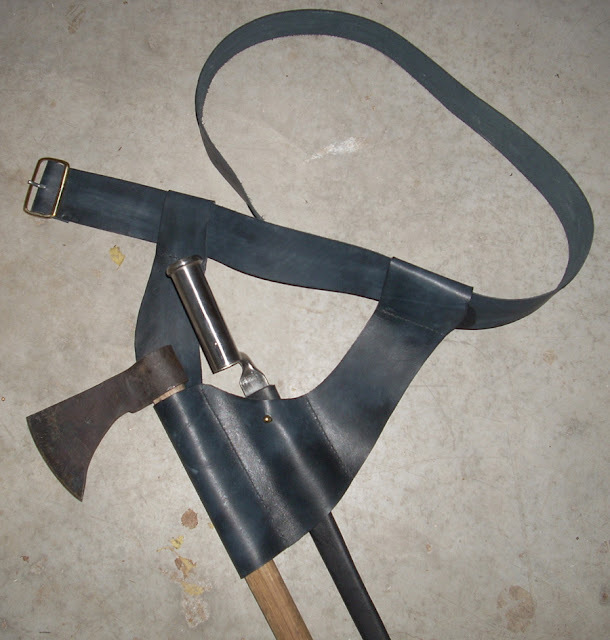 The typical and most common way for a woodsrunner to carry a tomahawk. This woodsman has removed the blade cover because he is using his tomahawk to construct a shelter. Again, you can see the tomahawk through the back of my belt with a linen cloth cover on the blade. My half-axe is secured under the ties on my blanket roll. This tomahawk frog belonged to a close friend of mine who went under some years ago. His persona was that of an ex Ranger and no longer needing to carry a bayonet for his Brown Bess musket, he ellected to make this frog to just carry his tomahawk. 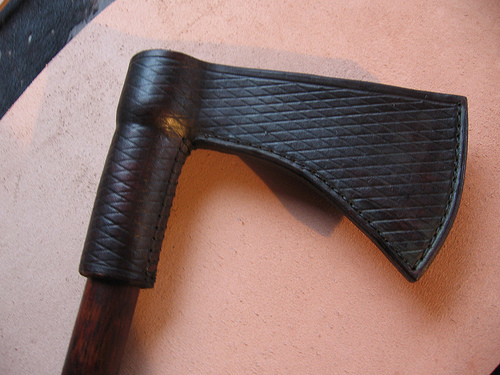 This shows my wife's belt axe in the frog. This is the type of frog carried by some Rangers and light infantry. This mid 18th century carrier is home made and designed to carry under the arm with the strap over the shoulder. This I believe is a copy of an original late 18th century tomahawk blade cover. I would not take this to be one of common usage. Blades of the 18th Century Woodsrunner 2. 1935 Gladiator Reenactment in Australia. Blades of the 18th Century Woodsrunner Part 1. This video also available on my DVD Primitive Skills 2. More Viking Living History. Looks like fun! The Battle Of Lexington and Concord. Tarred & Feathered. Not because of the price of tea! I stand corrected. Please read Jenny's comments below, she is far more knowledgable than I am regarding the revolution period. Thank you Jenny. I have searched for this video clip many times without finding it. My thanks to Flintlock and Tomahawk for posting this on his blog. Not a good image, but better than nothing. This is supposedly the first shot fired in the revolution at Lexington. But who fired that shot? It remains a mystery to this day. Genes hold secret of shipwrecked Anglesey bone setter. An interesting story that starts in the mid 18th century. Encampment In The Pine Forest Armidale NSW. 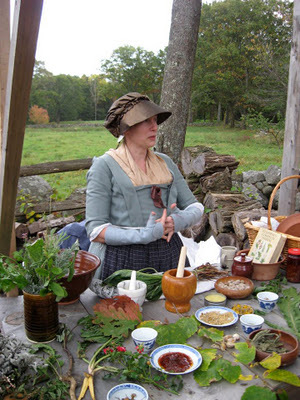 New England Medieval Arts Society. NEMAS in Armidale NSW. A little too early for me, but they are an Armidale Living History group and I feel they deserve a plug on this blog. A close friend of mine started this group about the same time as I started my group. 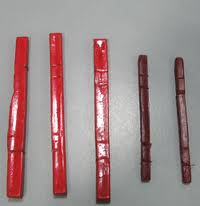 Pioneer Handbooks: - How pioneers made sealing wax. Like square thin candles. 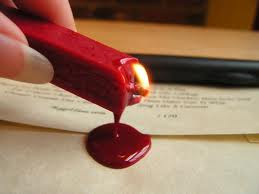 My Mother kept sealing wax sticks in her writing desk. 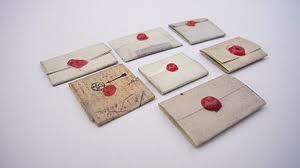 Our Family seal was similar to this 18th century one. 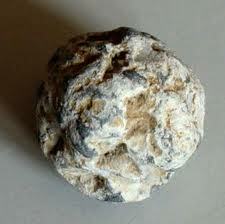 I believe the metal was pewter or lead. Guns in the New World. Britain's Brown Bess. Link to an Article. My thanks to http://illinoisrangersblog.blogspot.com/ for this link. 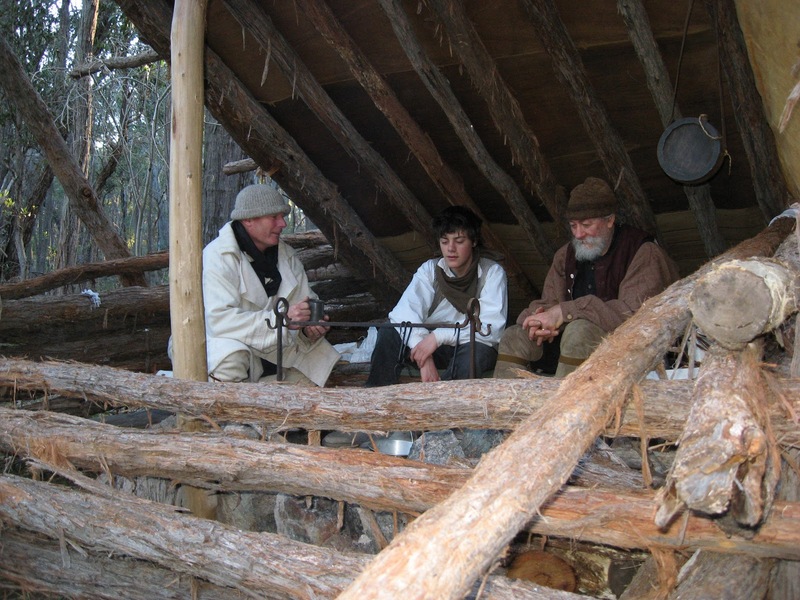 Wattle daub as a construction method was very popular, and the Europeans took this method with them to the New World. A Sheffield Jack Knife Being Made The Old Way. Note the use of a bow drill. 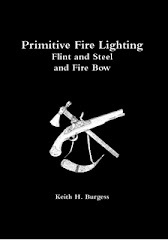 Pioneer Handbooks: - How settlers made fire starters. Wet Weather Fire Lighting. Finding Dry Kindling. Trailer-Cobbling Soles on Moccasins & Shoes. 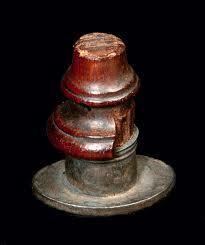 There are two videos on Cobbling Soles on Moccasins & Shoes, and both are on my Primitive Skills 2 DVD. This is just the first half of the first video. 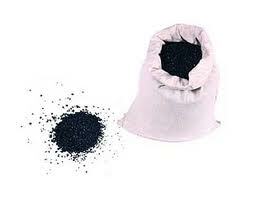 Gunpowder In The kitchen! At The Old Foodie Blog. Preserving Eggs and More. A New Blog. The Buzz At The Hive may well be worth following, probably not new, but new to me. I found some interesting information here, well worth a look. This is the half-faced shelter I built in the forest. 18th Century Medicine. A Link. E'tui or necessaire anyone. 18th century lady's things.